Delia Keary and Gary Kelly were involved in a fatal road traffic collision on Friday night. 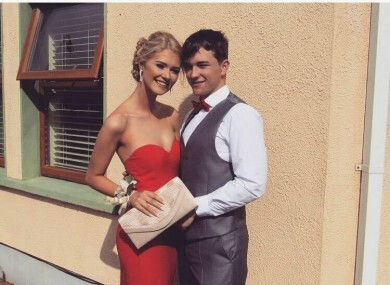 TRIBUTES HAVE BEEN paid to a young couple who lost their lives after a road traffic crash on Friday night. Delia Keary (18) and Gary Kelly (19) were involved in a two vehicle fatal crash at about 7.40pm on Friday night at Wards Cross, Abbeyfeale Co Limerick. Gary died at the scene as a result of his injuries. Delia was taken to University Hospital Limerick with critical injuries. She was pronounced dead on Saturday night. Tributes have been offered by friends of the pair – who were a couple – on social media. “Farewell to two good friends Gary Kelly and Delia Keary,” wrote one friend. I’ll miss you both and you’ll be remembered fondly by everyone who knew you. Rest in peace. The pair had attended secondary school together at Rice College in Ennis. “I can’t put into words or describe how I feel right now,” another friend wrote. Absolutely so shocking and heart breaking news, R.I.P. The funeral of Gary – who came from the Gort Road area of Ennis – will take place at Ennis Cathedral on Wednesday morning at 11am. Gary and Delia are two of the seven people who lost their lives on the road between Friday and Sunday. RSA CEO Moyagh Murdock said that all the deaths represented an “appalling loss of life” and expressed sympathy with the families of those who died. She urged motorists to take care on the roads and always behave responsible while driving. “These deaths should serve as a reminder to us all that using the road is the most dangerous thing we do each day,” said Murdock. They should remind us of the importance of behaving responsibly on the roads. Driving for the conditions you encounter, looking out for other road users, adhering to speed limits, never driving under the influence of drugs or alcohol, never using your mobile phone while driving, avoiding driving while fatigued and always wearing a seatbelt no matter how short the journey may be. On Friday, a cyclist in Dublin and a man in Tipperary died in separate incidents on the roads. Three other men died in separate incidents on the roads in Cork, Cavan and Mayo yesterday. Meanwhile, a 91-year-old woman remains in a serious condition after being hit by a car in Dublin on Saturday. The deaths bring to 43 the total number of people killed on Irish roads this year, compared with 42 for the same period last year. Email “'An appalling loss of life': Tributes paid to young couple killed in car crash”. Feedback on “'An appalling loss of life': Tributes paid to young couple killed in car crash”.